← Breaking News from Mars: Boston Bound! While picking up my Martian Marathon race packet at the expo, I got to talking with a woman whose husband is going to attempt his first ultramarathon. That’s macho enough in my book, but not for him; he’s going right to a 50-miler, and a tough one at that (the September North Face Challenge, as I recall). “Do you have any advice for him?” she asked. My next three races will all be on trails, and all are marathon length or longer. Time to put on a little weight! I’ll have one of everything, please! Songs are better in this version, however! I took my wife to see The Jungle Book on Saturday. So “The Bear Necessities” has been running in my head the past three days. Was even humming it while nose-deep in banana peels and water bottles at the Gazelle Girl. I volunteered once again for the “Green Team” at the Gazelle Girl half marathon & 5K on Sunday. Over 3,800 runners participated in the events, plus plenty of family and other spectators. That kind of crowd generates a lot of waste, and I spent much time sorting through it, but if one must sort trash, there couldn’t have been a more beautiful day for it. Part of the time I manned one of the ZeroHero waste collection tents, which we’ll also be using at the Trail Marathon races this weekend. More on that in an upcoming post. The good news: the great majority of the generated waste was either compostable or recyclable. Last year their total landfill waste didn’t even fill one small cardboard box. This year, due to unexpected non-recyclable packaging from their food supplier, there was quite a bit more. I’m sure they’ll fix that for next time. Also, for some reason far more non-recyclable coffee cups showed up this year. I’m calling you out, Starbucks, Biggby, and McCafe. Get with the program and go compostable! Bearclaw Coffee has, and they will be our coffee supplier at Trail Marathon. You can bet they’ll get a lot of good pub from us! If you’re coming to TMW, look for the orange van! Finally, what a great day it was in Boston today for the 120th Boston Marathon. Saw a thrilling men’s wheelchair division finish. And it was great to see Roberta (Bobbi) Gibb honored as Grand Marshall for breaking the gender wall in 1966. She “bandited” Boston that year after being denied registration due to her gender, beat two-thirds of the otherwise male field, and was the first woman finisher again in 1967 and 1968. I don’t cry at weddings, or much of anything for that matter, but I came pretty close here. Looking forward to joining the fun there in 2017! 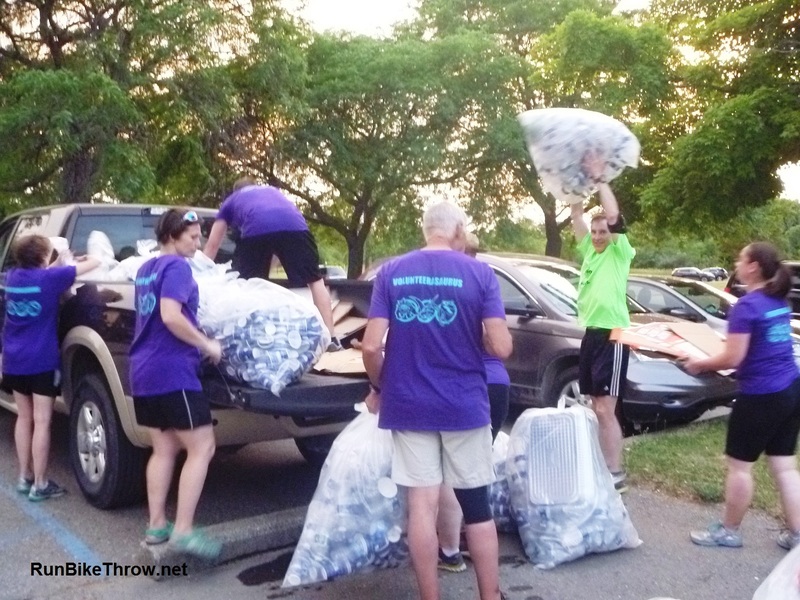 This entry was posted in Running & Cycling, Ultramarathons and tagged Boston Marathon, composting, fitness, Gazelle Girl, Green Team, recycling, Running, ultramarathons, zero waste, ZeroHero. Bookmark the permalink.